We fix natural stone and premium tiles in the Cotswolds, Stratford upon Avon, North Oxfordshire and South Warwickshire region, using a blend of old-fashioned methods and modern adhesives and finishes. We have an extensive portfolio of work demonstrating great outcomes from challenging briefs. If you seek a 'fix, grout and go' tiler you have probably found us in error, but if you are looking for fixers with an affinity for not just the tiling but how it links with your entire project, including transitions from one room or space to another, then we hope you will find us sensitive & accommodating to your needs. Wet-rooms are a regular task and we relish all challenges. We know good plumbers putting in leading edge systems on a daily basis. Thank you for coming to the tile-jc website. Please take a few moments to view the following pages, and contact John Chiffers to talk about your ideas. Diamond cut honed limestone is hand waxed and links living spaces. 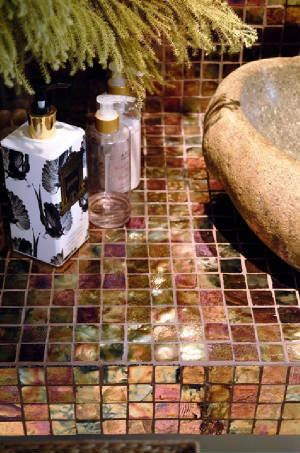 Unique iridescent glass complements sculpted pebble basin.